The different grasses present on the property are claiming our attention in 2012. We had been gathering information gradually about grasses and a visit by Bryan Hacker (co-author of The Grasses of Southern Queensland and author of A Guide to Herbaceous and Shrub Legumes of Queensland) in June 2012 answered more of our queries and identified two particularly serious environmental weeds – Paspalum conjugatum and Para Grass – which we have tried to remove or whipper-snippered to stop the seed heads. (See below). 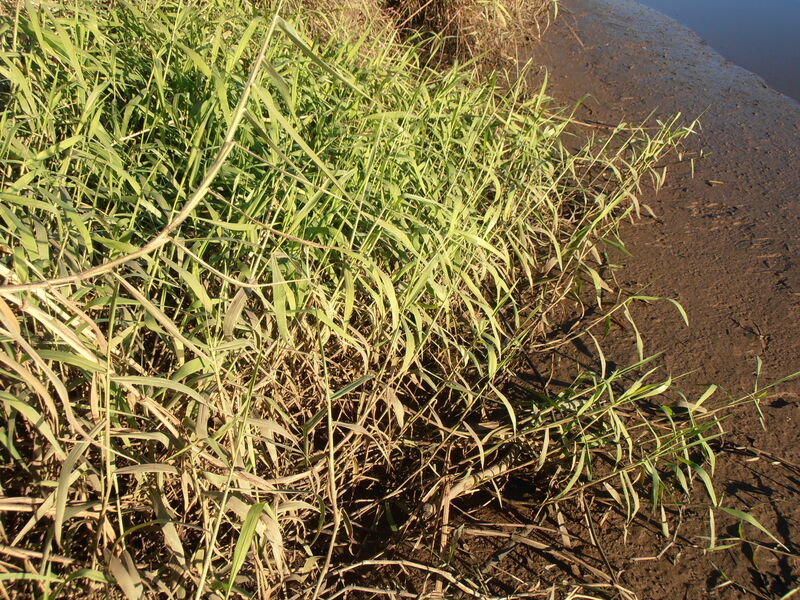 The predominant grass in the paddocks is Guinea Grass (Megathyrsus maximus var maximus – from Africa) but this grass also extends to most of the riverbank. We are not endeavouring to remove this grass as it is useful as mulch and as pasture for the horses, in addition to acting as a stabilizer along the eroded riverbank. Moreover, Guinea Grass is not a declared plant under the Land Protection (Pest and Stock Route Management) Act,2002. Our Land For Wildlife had pointed out this grass in 2010. 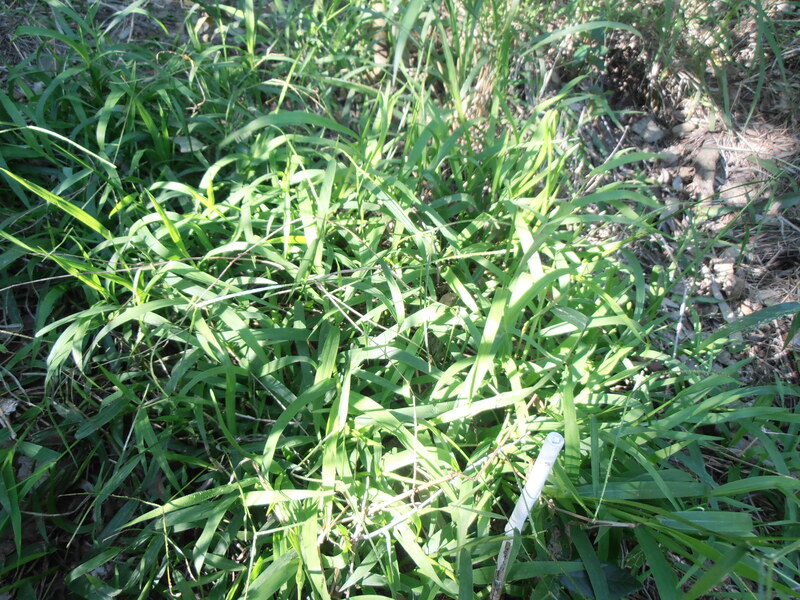 Inside the Brisbane City Council area, Guinea Grass is placed in Class C which means that landowners should contain and reduce the grass. The Council recognises that this species is well established in Brisbane and eradication is not a viable option. 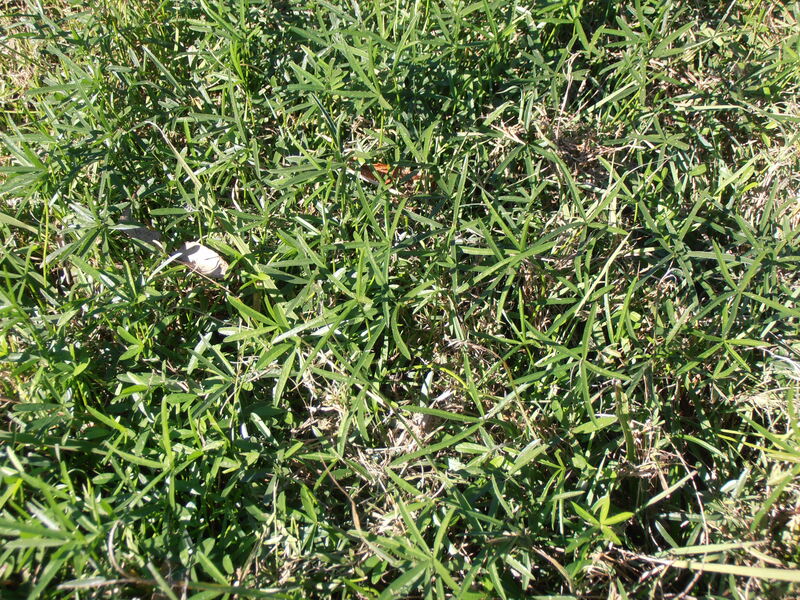 The predominant grass in the home enclosure is Couch Grass (possibly the Queensland Blue Couch variety – Digitaria didactyla which is native to Mascarene Island and widespread in the tropics). 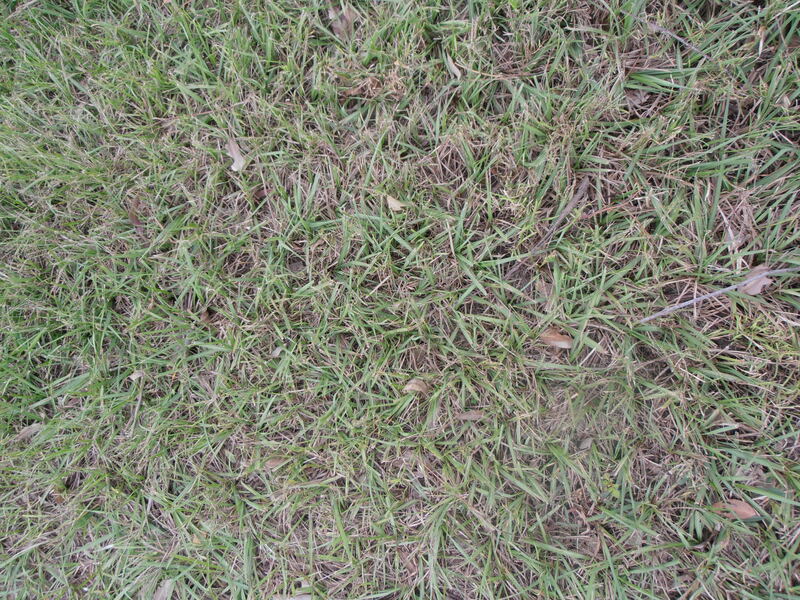 The following link describes the status of this grass as ‘not noxious’. 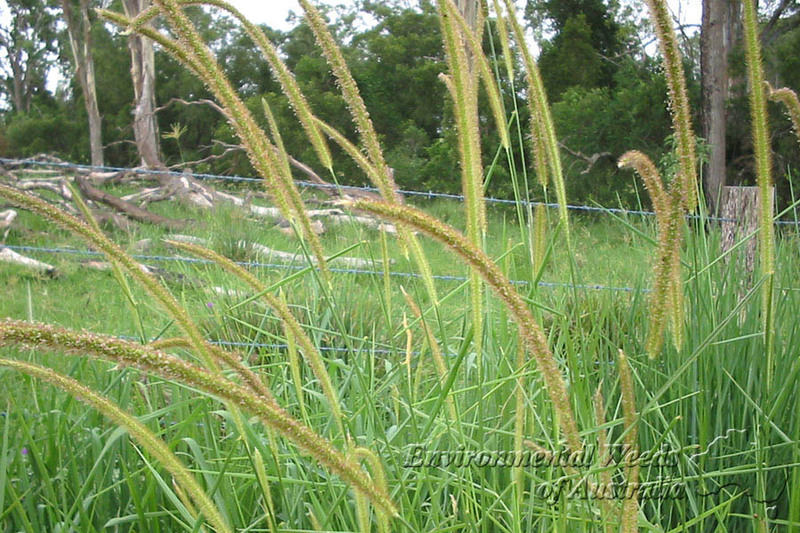 During the last two years there has been a resurgence of Carpet Grass (Axonopus fissifolius – from tropical America) in the home enclosure following the increased rainfall such that it has spread through the fence into a small part of the side paddock. During this time we also transplanted lines of Carpet Grass into areas under trees where the earth was rather bare as it is has such a luscious appearance and is soft underfoot. We will endeavour to contain this grass within the home enclosure as Bryan Hacker on p.7 of the Moggill Creek Catchment Group Autumn 2010 Newsletter says that Carpet Grass is less desirable than Rhodes Grass. 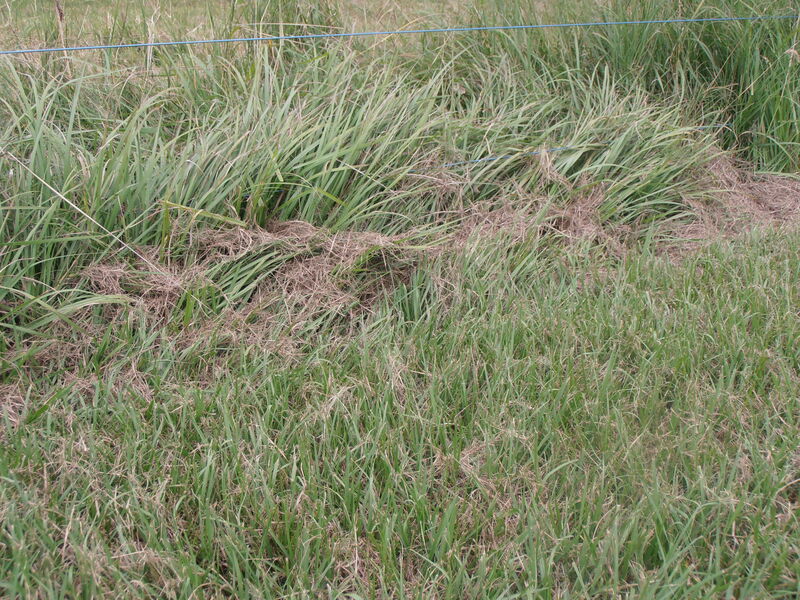 In April 2012 we received identification from Mt Cootha’s Herbarium of a grass that has been worrying us for a while – Bahia Grass (Paspalum notatum – native to Mexico, Central America, the Caribbean and South America). 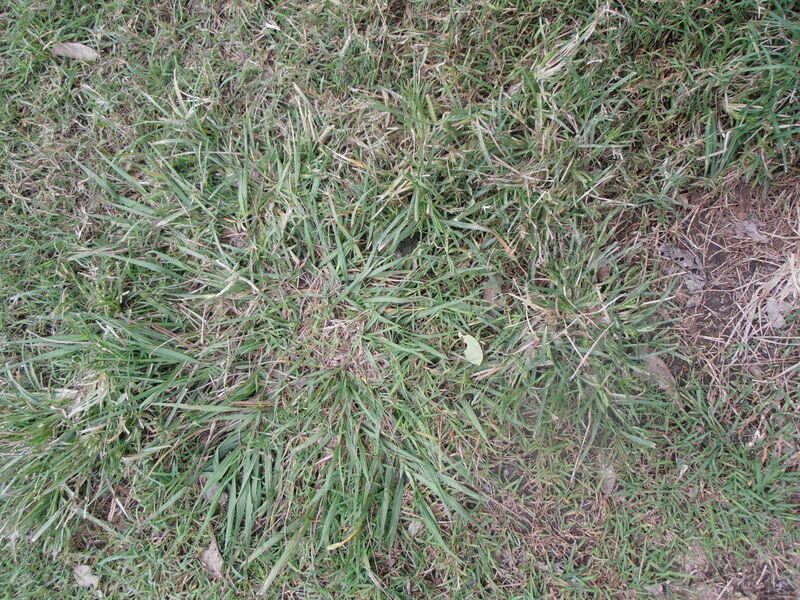 It has steadily been taking greater hold in the front paddock creating huge circular swathes ( as the horses prefer the Guinea Grass and Couch, they leave the Bahia Grass and it has invaded the other grasses) and has also spread into the lawns and side paddock. 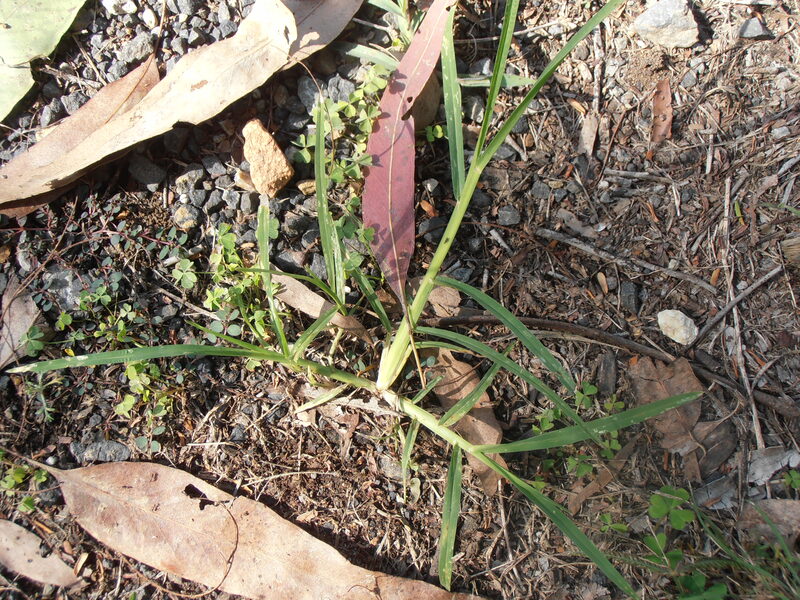 It is another grass for stock and is prevalent in the Moggill area e.g. all the verges mown by the Council are mostly composed of Bahia Grass along our stretch of Moggill Rd. Perhaps this type of undesirable grass has also been spread through supplementary fodder for horses as it is a common practise for landholders in this area to lease their paddocks for agistment for horses. It does seem to us that it has spread into places which were free of it only a year ago e.g. the area around our bonfire pile was beautiful soft Couch but now there are inroads of Bahia creeping further into the plushness of the Couch. After reading that it is regarded as an environmental pest and that it is difficult to eradicate we realise ‘we’ will have to spend significant time to deal with it (Ian volunteers to spray it!). However we may have to content ourselves with containing it within the paddocks and just trying to eradicate it from the home lawns. 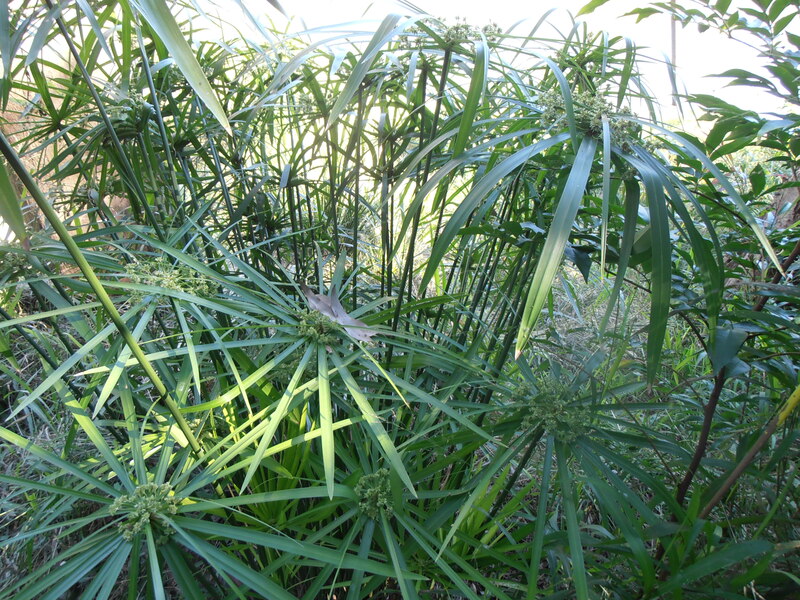 Moreover Nutgrass (Cyperus rotundus – from Africa, Europe, Asia) has been invading some gardens – notably the pool garden and the clothesline garden) as well as parts of the lawn. There is only one way to deal with it and that is persistent spraying. 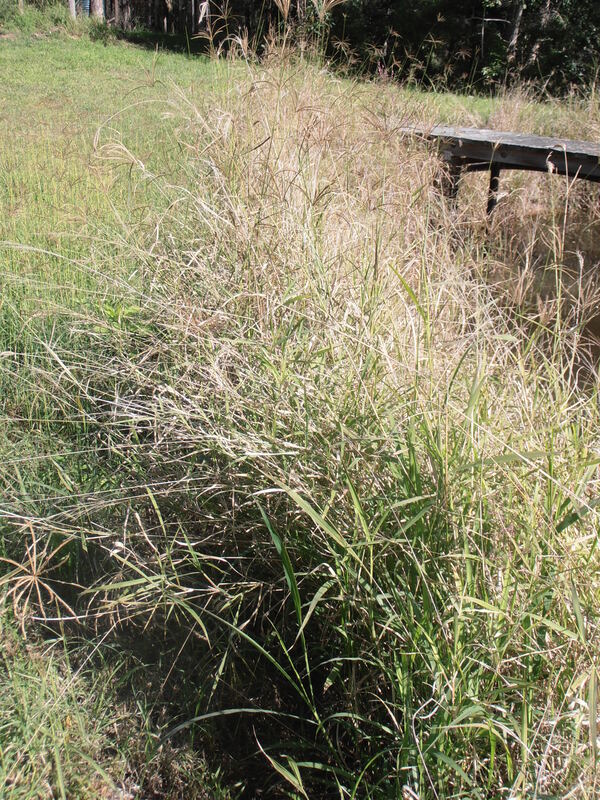 Lastly during a visit by our Land For Wildlife officer in May 2012, he identified most of the grass immediately around the dam as being Rhodes Grass (Chloris gayana -from south and east Africa). As we looked more closely around the side paddock and northern slope, we realised that Rhodes Grass is actually present there as well. 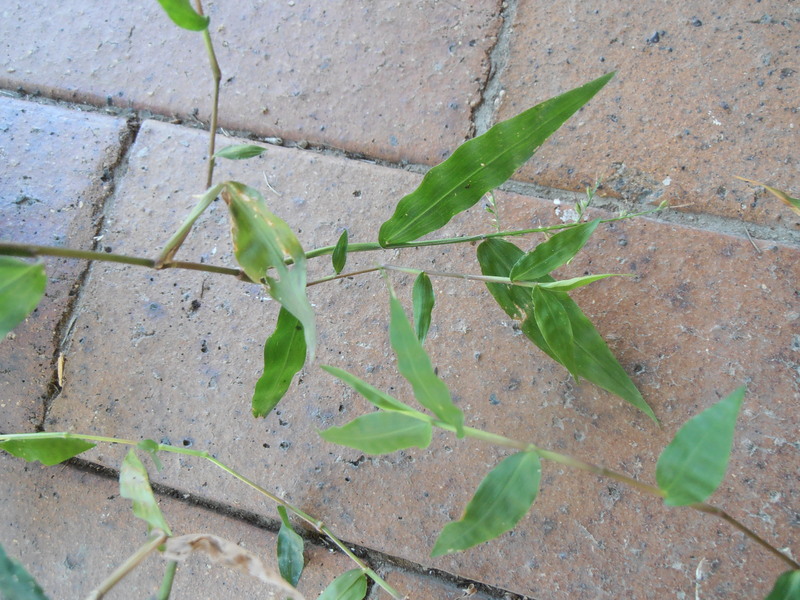 It too is a stock grass and common in the Moggill area. 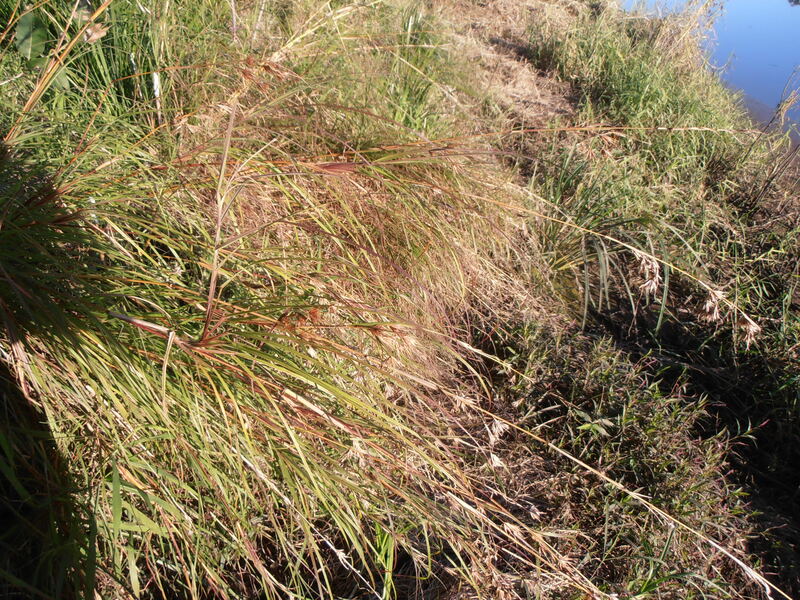 However, Rhodes Grass is not a declared pest plant under Queensland legislation and the Brisbane City Council places it in Class R – landowners should reduce infestations on a regular basis (see the link to Brisbane Council with regard to Guinea Grass above). 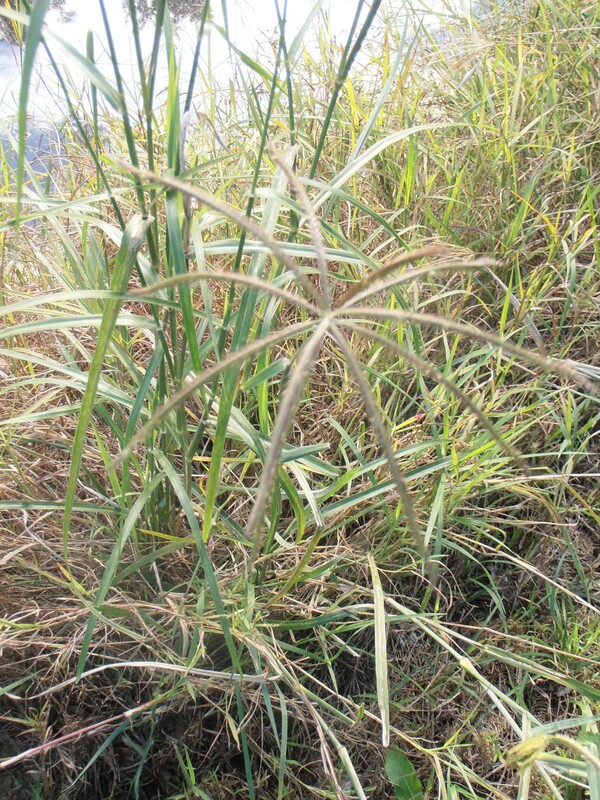 An infestation of Para Grass (Urochloa mutica) has occurred by the river. It is listed as an invasive plant. We quickly dug out and removed a small patch of Paspalum conjugatum (also known as Sour Grass, Water Grass, Johnson River Grass) in June 2012. Umbrella Sedge / Plant / Grass (Cyperus involucratus) has been growing along a small part of the river’s edge near the bays. On the cottage bank there have been a few patches of Natal Grass (Melins repens from Africa). It is very distinctive as the grass heads are a fluffy red. Ian has already sprayed this and we do not have a photo. There is more information on this grass which is listed by the Council as a weed but it is not regarded as such by the state government. Our main concern is to prevent these non-native grasses spreading and where possible to remove any grasses that are declared weeds which pose an environmental threat – Ian points out that once the canopy is established that will stop them! Thankfully there are lots of GOOD grasses to write about too. 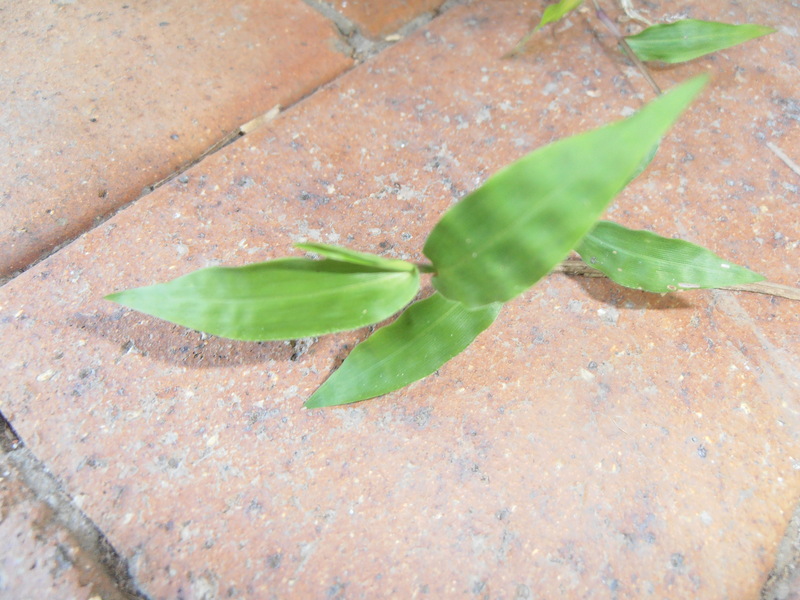 This is the host plant for the Chequered Swallowtail butterfly. It seem to be overtaking some of the bad grass in the side paddock It would be wonderful if it could out-perform the Guinea and Rhodes and Crow’s Foot. Technically it is a herb rather than a grass. We had planted this in the bays following the flood and it has taken off very well although a riverside is not its preferred location. We have tried Barbed Wire Grass ( Cymbopogon refractus) in a couple of places but it has not been successful at regenerating. It looks gorgeous so we keep planting new tube stock. Creeping Beard Grass (Oplismenus imbecillis) was already present in the groves and has been self-sustaining. In 2016 we also planted Poa Grass ( Poa labillardieri var. labillardieri) in areas where the Barbed Wire Grass had died but it does need more water than we anticipated. 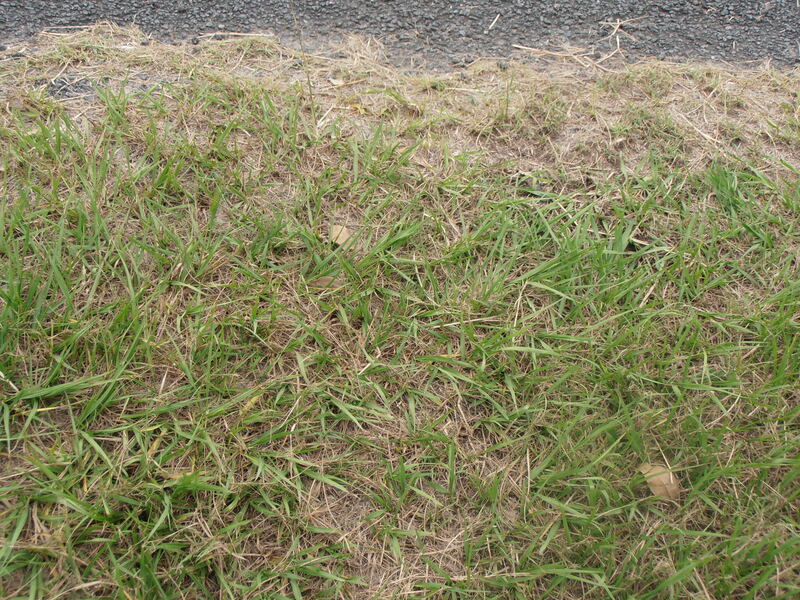 Bahia Grass has taken over Council verges around Samford as well. I treat clients lawns with Associate which acts very slowly, allowing couches & Pitted Bluegrass to repopulate. 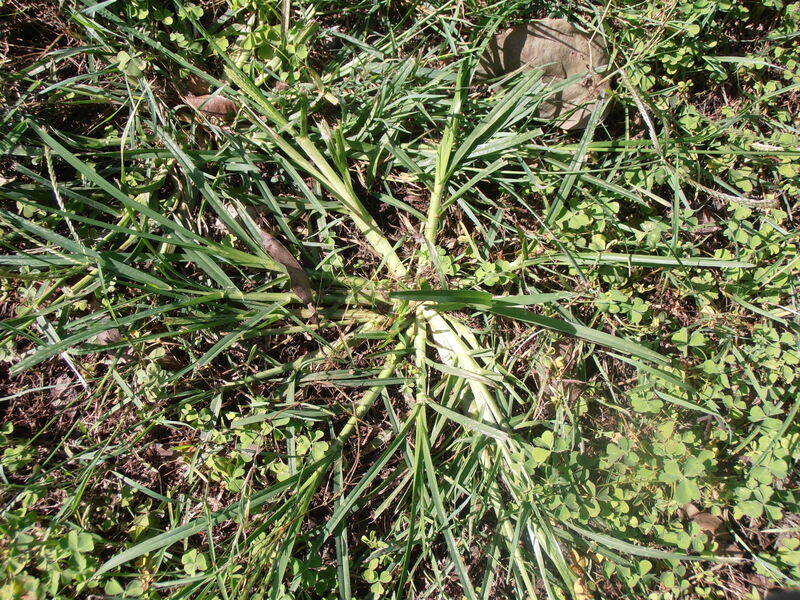 It also inhibits Mullumbimby Couch, allowing it to be pulled from the ground & setaria spp. 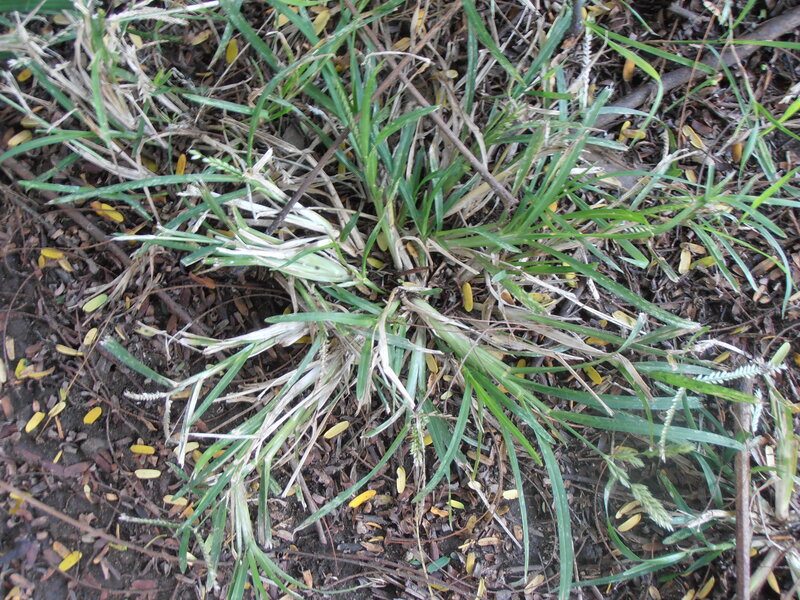 Sempra is used to control Nut Grass & Mullumbimby.